Visitors to the Smokies will love taking in the scenic panoramic views of Gatlinburg they receive at the top of this tower in Gatlinburg. Upon completion its completion in 1969, the Gatlinburg Space Needle was the second tallest tower in Tennessee and remains in the top five tallest towers in the state today. Climb to the top of this 407 foot tower in Gatlinburg and enjoy some of the best views of the Great Smoky Mountains in the whole area. Those looking for great views in Gatlinburg should look no further than the Gatlinburg, TN Space Needle. Come see why many visitors to the Smokies feel this is a must see on any Smoky Mountain vacation. Mount LeConte - It'll be easy to spot the tallest mountain in the eastern United States. Rising 6,593 above the foothills, guest gazing out from the Gatlinburg Space Needle observation deck receive great views of the natural landmark and the surround beauty of the Smokies. Changing Forestry - From the lush greenery of the summer to the bright reds, oranges, and golds of autumn, viewing the hills of Tennessee from the Gatlinburg Space Needle is breathtaking no matter what the season. Stunning Night Views - A trip up to the top of this tower in Gatlinburg provides great views of the lights of Downtown Gatlinburg at night. Free view finders help you observe all the beautiful features of the Smoky Mountain landscape that rest in close proximity. Guests may also want to bring their own binoculars to see details of the view from any vantage point on the Gatlinburg Space Needle's observation deck. There are benches where guests can repose and soak in all the details of the scenery. No time limit is attached to your Gatlinburg, TN Space Needle ticket, so feel free to linger in the beauty that surrounds you. The latest feature at the Gatlinburg Space Needle, "Higher Learning" provides visitors with an educational experience steeped in local history and geography panoramic views of Gatlinburg and Smokies as the backdrop. "Higher Learning" tells you what you are looking at, from roads to popular landmarks, in each of the directions, so, when you descend this tower in Gatlinburg and continue to explore Gatlinburg and the Smokies the ground, you’ll remember the view from the top you enjoyed from Gatlinburg Space Needle. 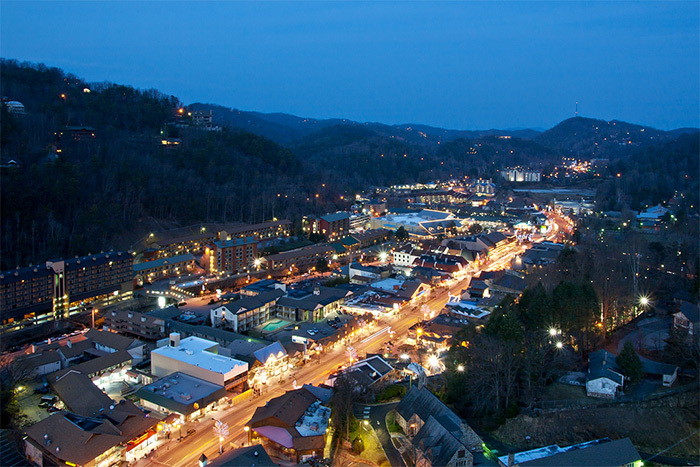 You'll learn interesting facts about Gatlinburg as well with a detailed chronological history of Gatlinburg. Did you know that President Franklin Delano Roosevelt and his motorcade drove down the Gatlinburg Parkway in 1946 on his way to dedicate the newly-formed Great Smoky Mountains National Park? Or that Billy Ray Cyrus was married in a Gatlinburg chapel? You'll more than your fair share of interesting facts. Aside from panoramic views of Gatlinburg the Gatlinburg Space Needle provides, at the bottom of the tower rests an arcade where your family can enjoy hours of fun and games at a reasonable price. Additionally, the Gatlinburg, TN Space Needle houses its very own magic show at The Iris Theater, where you can enjoy the mind-bending tricks of The Mentalist or the illusion and laughter of the comedy magic shows the theater boasts. Stay near the Gatlinburg Space Needle! A stay in one of Cabins USA's cabins near Gatlinburg affords vacationers to the Smokies a chance to enjoy all the comforts of home, a convenient location to Smokies attractions, as well as unique features such as saunas, theater rooms, and more! Come see why a cabin stay is the best way to enjoy the Smoky Mountains today!